Caring for your loved one after a dementia diagnosis can seem overwhelming, especially for inexperienced first-time family caregivers. In order to provide the highest level of care to your loved one, it will be important to learn as much about the progressive disease as possible. And of course, as you meet the changing needs of your aging loved one, it will be extremely important that you take care of your own needs and mental health throughout the caregiving process. As a leading provider of Clearwater dementia care, we wanted to share some valuable information about caring for a senior loved one with dementia. By knowing what to expect as the disease progresses, you can better equip yourself as a caregiver and in turn, provide quality care through early, mid and late stages of the disease. As dementia progresses, your loved one will need more help with everyday activities. While you always want to encourage as much independence as possible, it is important that you prepare yourself for their increased dependence as symptoms progress. Develop a hygiene routine that includes teeth brushing and bathing. Non-slip mats, grab bars or seats, and handheld shower heads can reduce the risk of falling in the tub. Choosing comfortable clothes for your loved one with elastic, zippers, and snaps rather than buttons can help him or her dress more easily. Dementia patients also have trouble sitting for longer periods of time, so offering smaller meals throughout the day can help ensure they meet daily nutritional values. Try to minimize distractions while eating and opt for finger foods as utensils become difficult for your loved one to use. Seniors with dementia may struggle to communicate, which can leave both them and you frustrated. Before you speak to your loved one, try to set a positive tone and make sure you have their attention. Then, speak slowly and clearly. Use short sentences and yes or no questions whenever possible. If your loved one is struggling to respond, be patient. Physical contact, humor, or rephrasing the question asked may also help keep your loved one calm and make it easier for them to respond. Consult with doctors to determine what the best care plan for your loved one may be. Be sure to take care of yourself and give yourself space to grieve and decompress. If you are feeling overwhelmed, look to friends and family for assistance with basic chores and errands. Clearwater Senior Care is another option and may help relieve some of the care burden, whether they offer help a few hours a day or a few days a week. Caregivers should also seek out dementia centered support groups. At the support group, whether it is in-person or held online, you can express your concerns and receive advice from others in similar situations. It’s great way to cope with a new and unfamiliar situation and can provide you with the support you need to continue providing quality care. 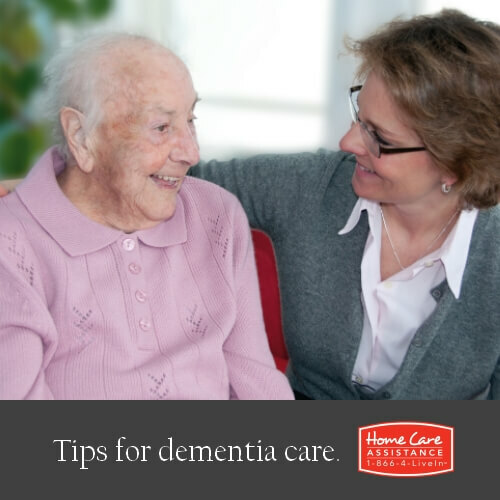 To learn more about dementia or Alzheimer’s home care in Clearwater, contact Home Care Assistance. We are a leading provider of senior care, offering highly customized care plans and a unique memory care program known as the Cognitive Therapeutics Method (CTM). This in-home program is unique to Home Care Assistance and utilizes memory games to promote cognitive vitality, brain health and overall quality of life for seniors at every cognition level. For more information or to schedule a free, in-home consultation, call 727-330-7862 and request information about our dementia, Alzheimer’s and CTM programs.